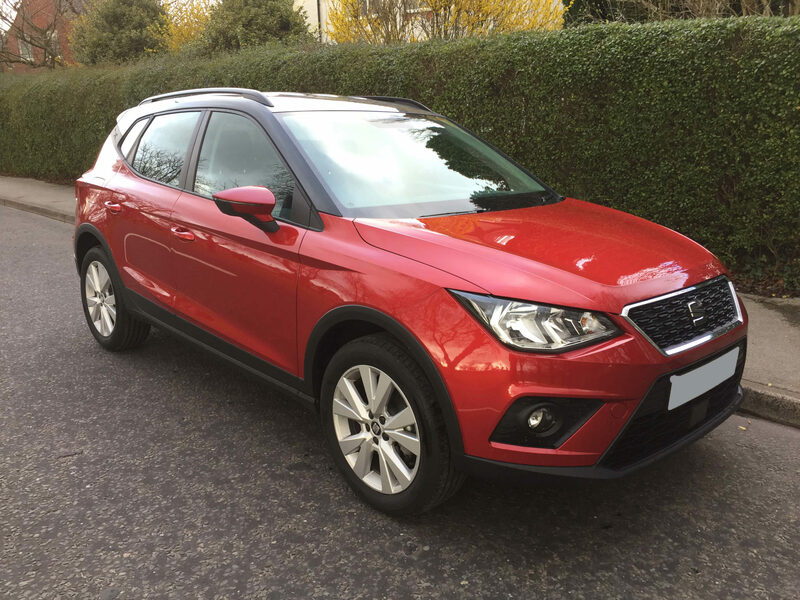 The latest vehicle to be put through its paces by Dualdrive’s experts is the SEAT Arona. 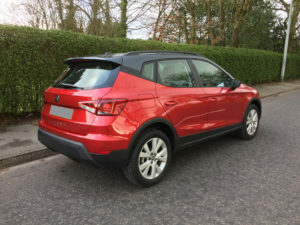 This is the smallest SUV that SEAT have to offer and is a direct rival for the Captur/Juke/Kona. Here at Dualdrive we have seen an increase in enquiries on small SUVs and more instructors taking this type of vehicle on a lease. With 1 in 3 new car sales in Europe now being an SUV it’s a growing trend and we were keen to research how practical small SUVs are for driving instructors. Our model was second up from the entry level model, the SE Technology, and came with the 115ps 1.0 petrol TSI engine and 7 speed DSG auto gearbox. Colour wise it was in the striking Desire Red with black roof. All metallic paint on the Arona is free of charge and it received lots of compliments. You may be wondering why we test drove an automatic. Well it’s a fact that more and more vehicles are going to be automatic in the coming years due to the focus on hybrid/electric cars. We were also interested to test out the WLTP fuel consumption figures (the laboratory test used to measure fuel consumption) against the comparable manual model to see exactly how fuel efficient modern small automatics really are. Stated figures on the SEAT website confirm less than 4% difference in overall fuel consumption and the DSG auto model actually has lower CO2 at 112 versus 115 for the manual. In fact, this engine/gearbox combination is even cleaner than the 1.6TDI which is 113g/km CO2. Over a week of mainly urban driving with a couple of shorter motorway trips we averaged 41.2mpg which we were amazed at. However with the 7 speed box the car quickly changes up so before you know it you’re in 5th gear at 30mph so it’s making the efficiency gains for you! The engine is extremely quiet and the stop/start works efficiently, we were expecting a bit of noise and thrum seeing as the engine is a 3 cylinder but it was one of the smoother ones we’ve driven and definitely comparable to the Ford Ecoboost engine. Size wise this car is just under 8cm longer than the Ibiza hatchback and exactly the same width. It is just under 11cm taller than the Ibiza, so it is hardly any different from the standard supermini in the size department. The Arona also feels just as manoeuvrable on the road. The car almost feels ‘boxy’ in a positive sense so it’s easy to park, even in tighter spaces. We also appreciated sitting a little higher up to see what’s happening ahead on the road. With an impending house move, the Arona’s boot was put to good use on tip and charity shop runs; with the seats folded it’s really spacious. We also had no problem getting a couple of kids bikes in too. That’s the added appeal of a car like this, as well as being your office/learner car but it is also easily used for everyday family life which negates the necessity for a second car. The interior of the Arona had everything we needed. Sat Nav was standard but the car also comes as standard with Full Link smartphone integration (which includes Mirror Link, Apple Car Play and Google Android Auto) and also a wireless charger. It was great to see a dashboard which had rotary controls for heating/ventilation that could be controlled without taking your eyes off the road; mostly it was easy to use and everything was logical, which you’d expect from a VAG Group car. Some would call the interior boring (yes, it probably could do with a bit more colour) but it’s durable and easy to live with. 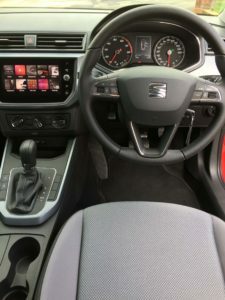 It’s clear that SEAT have reverted to a more minimalistic style in the Arona SE Technology. The wing mirrors give a decent field of vision and although visibility overall is acceptable, the rear quarter vision isn’t the best. However nowadays most people nowadays will rely on sensors too. So if you see yourself in a SEAT Arona, take a look at our offers page and get in touch!